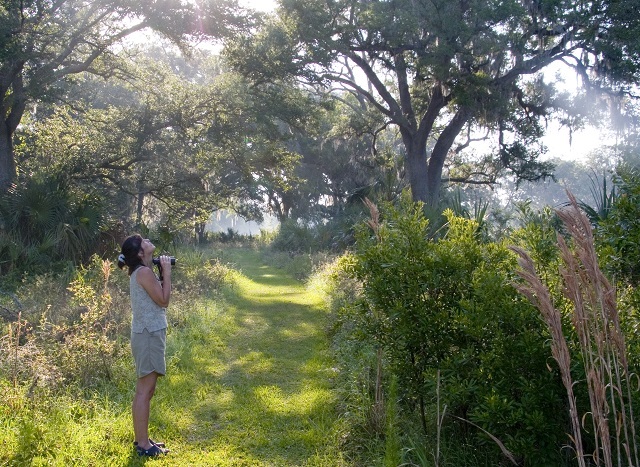 Enhance your outdoor skills on the Eco-Walk Trail, part of the scenic 27,295-acre Crystal River Preserve State Park. Numerous benches and 11 interpretive “discovery” stations along the trail make this a great educational spot and a fun destination for family outings. This pleasant foot trail loops for 2 miles through wet prairie, hardwood hammock, pines and freshwater swamp and offers up a surprising diversity of birds. Yellow-breasted Chats, Worm-eating Warblers and Swainson’s Warblers pass through in spring, Soras and both bitterns inhabit the ponds in season, and House and Sedge Wrens skulk in the vegetation during fall/winter. Other Neotropical migrants like Eastern Kingbirds and Yellow-throated Vireos turn up in fall. Open areas are good for American Kestrels and Red-shouldered Hawks, as well as Swallow-tailed Kites in summer. White-tailed Deer, Wood Ducks, Sandhill Cranes, Northern Bobwhites, Osceola Wild Turkeys, Pileated Woodpeckers and Carolina Wrens are possible here.